President Moon Jae-in on Tuesday urged stepped-up efforts to eradicate sexual abuses and discrimination at workplaces, as the country marked its 23rd annual week of gender equality. "In the candlelight vigils and the recent Me Too movement, the people are urging us to build a sound nation, a fair nation and a nation of no discrimination. We will have failed to meet such a demand should we be unable to eradicate gender discrimination and sexual violence that are deep-rooted throughout our society and build a democratic society of gender equality," the president said in a Cabinet meeting held at his office Cheong Wa Dae. The president noted the weekly cabinet meeting planned to discuss additional steps to ensure gender equality and prevent sexual harassment, but said such efforts may not require new measures. "The fact that additional measures will be announced despite many steps the government has already taken means we need stronger measures. 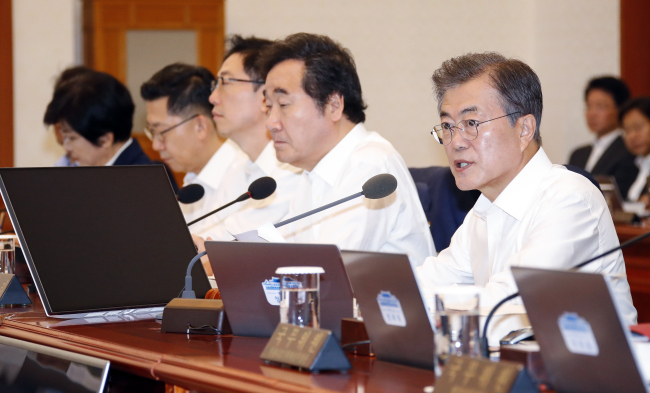 However, what is more important is that we thoroughly implement the existing steps rather than seeking new measures," he told the meeting, according to Cheong Wa Dae pool reports. "Making sure that our determination (to fight sexual violence) that we will gather at the cabinet meeting today will penetrate down to all government offices and their workplaces and will be thoroughly implemented is most important," he added. The president also called for thorough measures to help minimize damage from seasonal storms with a typhoon currently approaching the nation. "It is regrettable that we have suffered various damage and injuries due to torrential rains and the typhoon despite the government checking its preparations while local governments are also doing their utmost to prevent damage," Moon was quoted as saying.